Don’t get me wrong, they’ve always been there, but somehow someone forgot about them and weren’t used. Since last week my mind has been on other things, I’m intending to write a series of articles and didn’t have much of my brain to get me write a post for this week, so finally I decided to speak about some issues which have been already described, but I believe they are good to be reminded. So statistics are the base for the cardinality estimator (CE from now on) to figure out how many rows will be returned by an operator during the execution of a query, I described some behaviors already in previous posts, so this time I’ll go a bit more to the specifics. So far and for recent versions of SQL Server, we have 2 (I’d say 3) different versions of the CE. It was one of the big announcements for SQL Server 2014 and that left the picture like this. So in SQL Server 2016 we have been given an improved version of the CE, which for the examples of this post, I think would be version 130. I’m sure there are many small differences but I just want to talk about how the estimated number of rows differ from one version to another when we query a single table using two predicates and we have multi-column statistics that cover the combination. 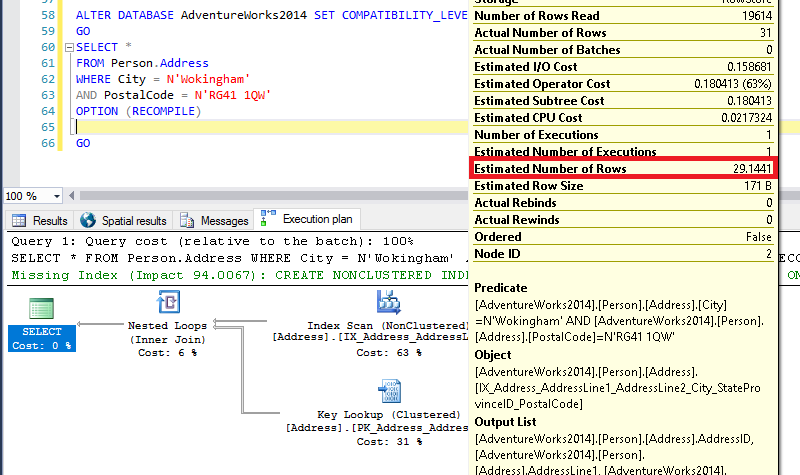 In order to provide the 3 examples, I run my SQL Server 2016 Dev Edition instance with the sample database AdventureWorks2014. This estimated number comes from the statistics we have just created, if we have a look at them, I’ll show you the maths. By multiplying the number of rows by the all density for the combination of columns, we get the number shown above 19614 * 0.001485884 = 29.144128776. The actual rows is 31, so in this case the estimated are not far off the actual. See how this is way off, all this marketing about the benefits of the new CE and this… Disappointing! This version of the CE does not care about the existence of multi-column stats and just does the maths looking at single column stats. which makes the estimated value. The average is 29 and the current is 31 just because both are directly correlated, but what if we were requesting a post code from a different city? The result would be zero, so 1,24 would be way better… Difficult to estimate correctly every time. 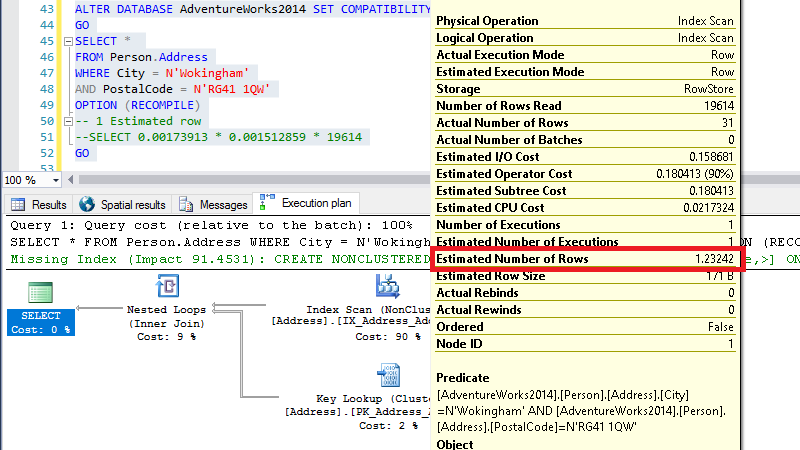 And finally, how things are in SQL Server 2016? Again we have the 29.1, so the new new CE is looking at multi column stats again. And With great power there must also come great responsibility, if we create multi-column stats randomly, we might be hurting performance for a lot of queries that would benefit from some correlation, but imagine we have for example dynamically loaded select lists which depend on the previous, this can be a great enhancement. As always there’s no single truth. It will vary for each and every case, so test, test and test before opting for one or another. Just to wrap up, a few links for reference. I believe SQL 2014 had CE issues and needed trace flag 4199 to make it work better? 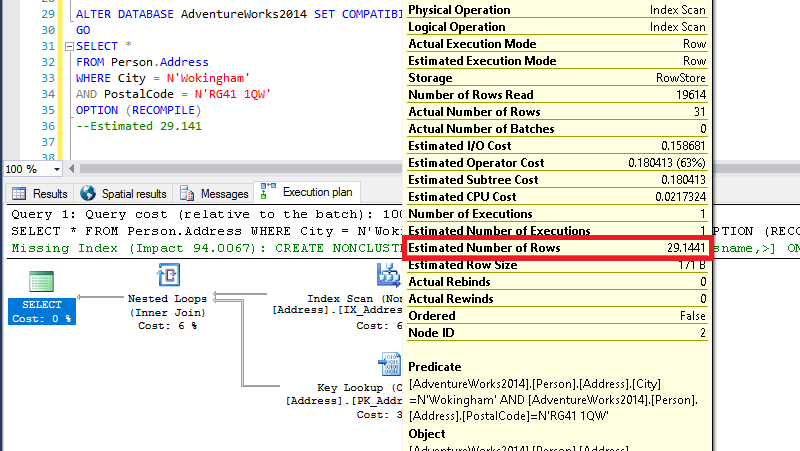 Your second calculation for the SQL Server 2014 CE model is slightly off. You’ve taken the denisty values from the density vector, but the exponential backoff algorithm used by the query optimiser uses the selctivities of the predicates calculated from the histogram. In your case, both predicates, (City = N’Wokingham’ AND PostalCode = N’RG41 1QW’) result in direct histogram step hits making the cacluation somewhat easier. From the histogram, Wokingham has 31 EQ_ROWS (EQUALITY_ROWS) so the selectivty of the Wokingham (S1) would be this number divided by the total number of rows in the table shown in the statistics header eg 31 / 19614 = 0.0015805037218313 and it just so happens that the other predciate has the same selectivity. Using these numbers, you end up with the correct estimate of 1.23242 and not 1.23745851256889. Thanks very much for pointing this, I totally missed that bit. I’ll update the post. I am facing a strange behaviour I cannot understand., and I would really appreciate your opinion. Instead, I an getting 6,78 row(s) .. and I really don’t understand where this value comes from. Using the new CE I am getting 28,71 (as expected) instead.